As much as I'd like to, I don't wear false lashes on a daily basis, simply because I either don't have the time or I'm just too lazy to even bother putting them on. I also have very deep set and 'curved' eyes, so though I'm quite experienced with putting on lashes, it's still a pain sometimes to do because even with a good quality glue, the lashes initially have a hard time conforming to my eye's shape no matter how much I press down. 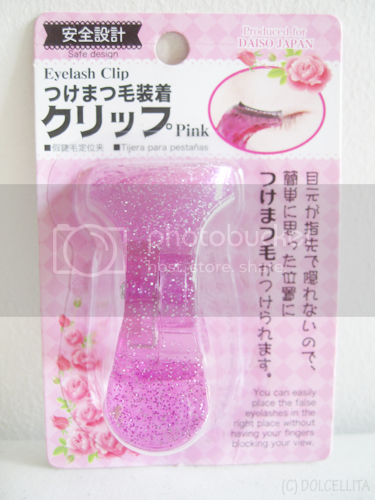 Unable to read Japanese, I can't tell you much other than the fact that it's what's called an eyelash clip that's supposed to help you both grip and apply your false lashes easier, and it's produced by the familiar Daiso Japan brand. Now a tool like this is nothing new. I've seen false eyelash brands like Ardell and DUO even include a free eyelash clip with some of their lashes. They only really differ in terms of design and brand, but the purpose and concept remains the same. The illustration on the packaging already gives you a better idea on how to use it if you're not sure. 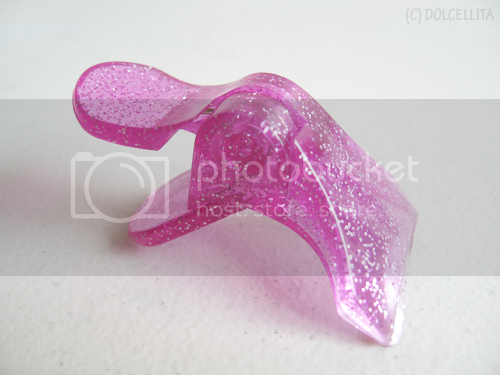 The clip is made of a durable plastic and is covered in large chunks of embedded glitter. Very girly! 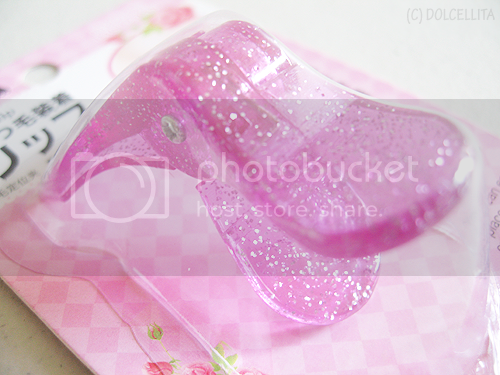 I'm not sure if it comes in other colors aside from pink, but this is the only color I saw available when I bought it. This is how I use the clip. As you can see, very straightforward and easy. Just insert your lash, curved side up, apply your eyelash glue onto the lash (of course waiting for it to get tacky or sticky), then place it on as you would naturally. 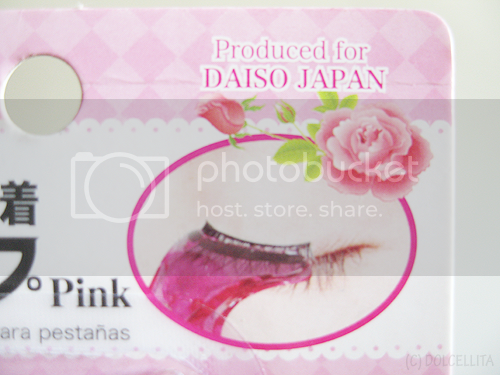 Fit with the line of eyelashes clip, place the false eyelashes root part (where glue is applied) in front and pinch it. 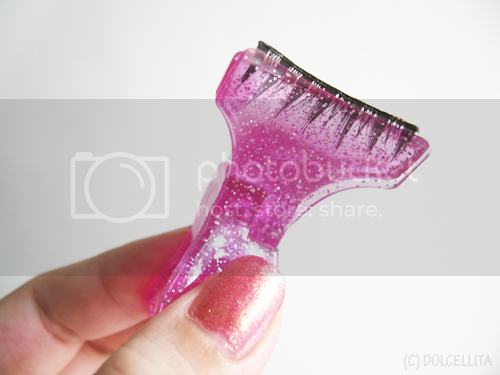 While holding the lashes with the clip, apply glue on the roots. When glue is starting to dry, use the clip to place the false lashes on the roots of your natural eyelashes and gently press down. Adjust with your fingers. The clip not only helps you apply the lash better and more accurately to your lid, but for me, it helps hold down the entire thing as you wait for the glue to set further and bind securely. That's when I let go and do any further adjusting and pressing if needed. It helps you apply your false lashes more accurately and lets you see what you're doing better. The clip grips the lashes securely. Very affordable at less than PHP100.00. Ooh I've actually never seen this :D It looks like it would be useful ^^ Thanks for sharing! Oh, lucky! I just end up throwing mine into my larger makeup kit, haha. Yours is cuter. Mine has an eyelash stand but it's a little clunky and this seems easier to maneuver around the eyes.